Recorded as Hurran, Hurren, Harrell, Harrill, Horrell, Hurrell, Orrell, and others, this is an English diminutive surname, but of Norman-French origins. Introduced into England at the famous Conquest of 1066, it derives the verb "hurer" meaning to bristle or stand up, and was originally a nickname for someone with a good head of hair. An example of an early recording of the name is that of Richard Horel in the charters of the abbey of Rievalux, Yorkshire, and dated 1154, and John Hurle, in the Oxfordshire Hundred Rolls of landowners in 1273. 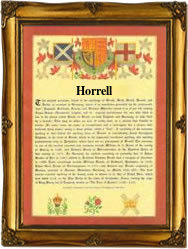 Later examples taken from surviving church registers of the city of London include Grace Hurrell who was married to Nicholas Reynolds on the 17th September 1627 at St. Gregory's by St. Paul, London, whilst on May 11th 1648, William Horrell married Aphra Thomas at St. Botolphs Bishopgate. Surnames became necessary when governments introduced personal taxation. In England this was sometimes known as the Poll Tax. Throughout the centuries, surnames in every country have continued to "develop" often leading to astonishing variants of the original spelling.